Cover yourself in the robust emblems of a vanished civilization with Aztec tattoos - from dramatic and vivid spirit animals to bellicose gods, or an elaborate calendar that assigns each division of days to a different god. Aztec symbols are visually appealing symbols of power. Aztec culture was intensely colorful, reflecting the inescapable sun of the subtropics and the paintbox hues of the rainforest and its creatures. A back, sleeve, or chest piece that strives for authenticity would be filled in with hot, bright colors and plenty of green, with the outline of the shape "popped" in black. But while tribal tattoos are originally from the South Pacific, they've become so popular that there are now tribal black and gray-tone Aztec scenes and symbols as well. Some of the tribal shapes conform to a more abstract interpretation of Aztec designs. The sacred Aztec calendar (not their more prosaic time-keeping calendar) is often borrowed for creating tattoos. The carved Calendar Stone, with its segmentation into realms of various gods and depictions of the founding myths of the empire, needs a little space to be clearly drawn. A simplified calendar will fit on a forearm or the top of a foot. But find a larger expanse of skin such as your chest, shoulder, or back for a detailed calendar that includes the faces of the sun gods, jaguars along the sides, and the fine Aztec artistry still visible on the original, ancient stone. 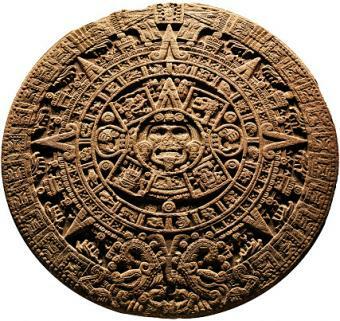 The Calendar Stone, or Sun Stone, is considered among the most exquisite examples of surviving Aztec art. The sun was at the center of their cosmology - a many-faceted complex pantheon of gods with a number of them depicted on the stone. As such, it is a potent symbol affirming life - a compelling argument for choosing the calendar as a tattoo. Highly ranked warriors in the Aztec culture could choose to align themselves with two gods in particular, each linked to a magnificent predator animal. Huitzilopochtli was a sun or day warrior who could take the form of an eagle. As a warrior, his profile features a feathered headpiece with a beak that projects out from the forehead. 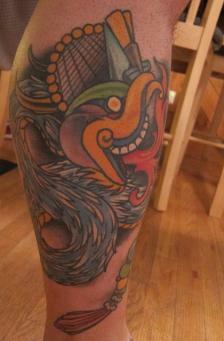 In a tattoo, Huitzilopochtli could be combined with massive eagle wings. The eagle was strong, swift, and deadly - all the attributes of a successful warrior. Many eagles are drawn with the head facing west, feathers rising almost like a comb from the top of the head, and with the beak open, ready to attack. Tezcatlipoca was a warrior god of land and the night with the power to send hurricane winds to destroy everything in his path. His attributes are destiny, war, and royalty - a dark god. He was a shapeshifter and a sorcerer, definitely a bad boy. Tezcatlipoca lost one foot destroying a sea monser who threatened to devour the cosmos, so his claw foot is a sign of his determination and heroism. He is linked with the jaguar, another powerful warrior symbol. 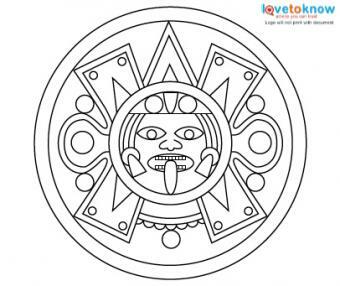 Tezcatlipoca, like most warrior gods, is often depicted with his tongue sticking out. Mesmerizing, deadly, agile, and beautiful, the jaguar can see in the dark. Its eyes seem to mirror its victims and they cannot break free of the jaguar's spell. All these warrior qualities meant the jaguar was the spiritual and physical equal of elite human hunters and would always overwhelm its prey. 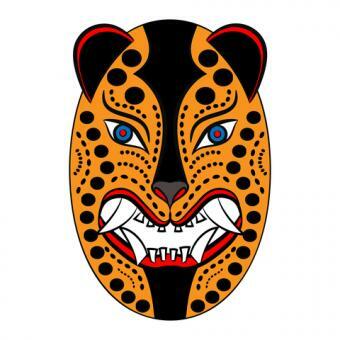 A jaguar tattoo in black evokes the cat's association with death and vanquished enemies. A colorful jaguar, with its distinctive rosettes, recalls the fearless warriors and kings who wore jaguar skins to broadcast their invincibility to their enemies. 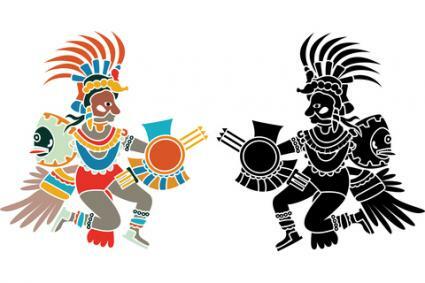 Aztec emperors were mortal gods who controlled the welfare and warfare of their empires. The emperor wore a feather headdress for ceremonial occasions, often made from iridescent plumes of the exotic quetzal bird and embellished with gold and precious gems. Wear a feathered warrior god or an emperor on a wrist, calf, or shoulder blade to signify that you are a leader and a competitive combatant for causes you believe in. You could start with a black illustration outline like the free flash download below and decide to have colors inked-in later, or add more details and images to create a full sleeve or calf. Aztec society was sharply stratified - only members of the upper classes and elite warriors wore jewelry. 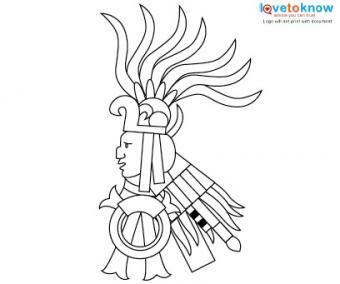 Pieces were commissioned by important people to commemorate important occasions - you may find that an Aztec tattoo for the wrist, ankle or breastplate serves the same purpose for a milestone in your life. The few original Aztec pieces that still exist after the Spanish stole and melted down most of the exquisite Aztec craftmanship include armbands, bracelets, and ankle or leg bands. An upper armband or a lower calf band in tribal style is large enough to include a simple geometric Aztec pattern for the band plus a totem or "jewel" that represents a symbolic cultural icon, such as a sun shield used in battle. Bands and bracelets may be inked-in with colors or left monochrome black and gray. The flash image below is a free download to use as a stand-alone tattoo or the centerpiece for a band or a larger work. 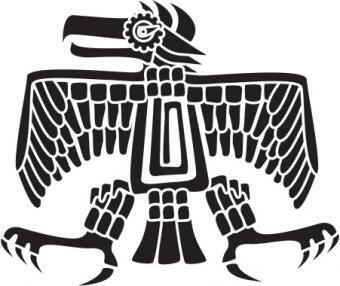 Quetzalcoatl, the Feathered Snake, is a sky god - the creator of the cosmos and of the final version of humans. 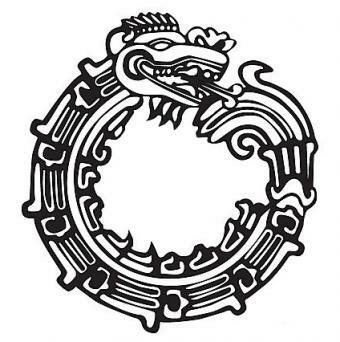 He is often depicted as an ouroboros, a circular, dragon-like snake that appears to be eating its tale. This is a powerful cross-cultural symbol for death, resurrection, and eternal life. 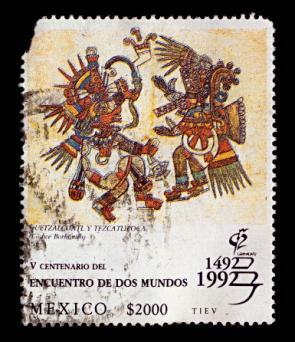 The Aztec ruler Montezuma mistook Hernan Cortes for the return of the god Quetzalcoatl, which brought about the fall of the Aztec empire. 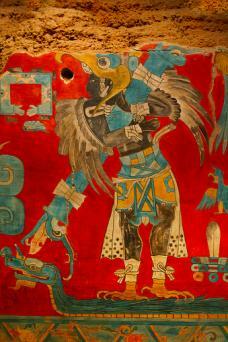 Ink a Quetzalcoatl on your skin in living color or ominous black to declare your personal resilience to the world. The Aztec empire flourished in Mesoamerica (now Mexico) between 1345 and 1521 CE, when the Spanish conquistadors arrived with their treachery, European diseases, and their hunger for gold. Aztecs were phenomenally successful developers of trade and agriculture - their art and symbolism reflect exposure to other regional groups and a high level of cultural sophistication. The brutal romance of that powerful empire and the distinctive beauty of its iconography translate well to a modern world. Your own fierce Aztec tattoo links you to a legacy of magical secrets and legendary strength.